Our big oaks have been especially vulnerable to cankerworm infestation. I am declaring victory in the ongoing war against the fall cankerworm. Residents of Mecklenburg county have fought this arboreal pest for twenty-five years. It seems that we can now rest until a new infestation arrives. This April marks the third spring in a row where I have neither seen trapped females in my Tanglefoot-smeared tree bands, nor spied the little inchworms rappelling down invisible threads to my hair and shoulders. The fall cankerworm (Alsophila pometraria) is an insect native to North America. It is typically found from Georgia to Nova Scotia and west to Texas. It has a four-stage life cycle: egg, pupa, larva (caterpillar), and adult. After mating in December, the female moths crawl up trees to lay their eggs on twigs and small branches. As the trees leaf out in the spring, the eggs hatch, leaving small green caterpillars to feed on the leaves. In most cases, the cankerworm will not kill the trees; however, repeated defoliation can weaken trees and make them more susceptible to other stresses, such as age, drought, other insects, and disease.​ ​​​ Experts have recommended placing bands around hardwood trees to trap the females when they emerge in December and so interrupt their life cycle. Those of you who did join the battle bands should now take those bands off. When I performed this task this past weekend, I found the batting next to the tree to be soaked with water. Continuing to hold that waterlogged batting close against the bark will lead to fungus, other diseases, and easy entry through rotten wood for other insects. I’ll say it again, take your bands off. Tom Watson is a Volunteer Extension Master Gardener in Mecklenburg County. He has also received a Certificate in Native Plants from UNC-C and a Certificate in Horticulture Technology--Residential Landscape Design from CPCC. 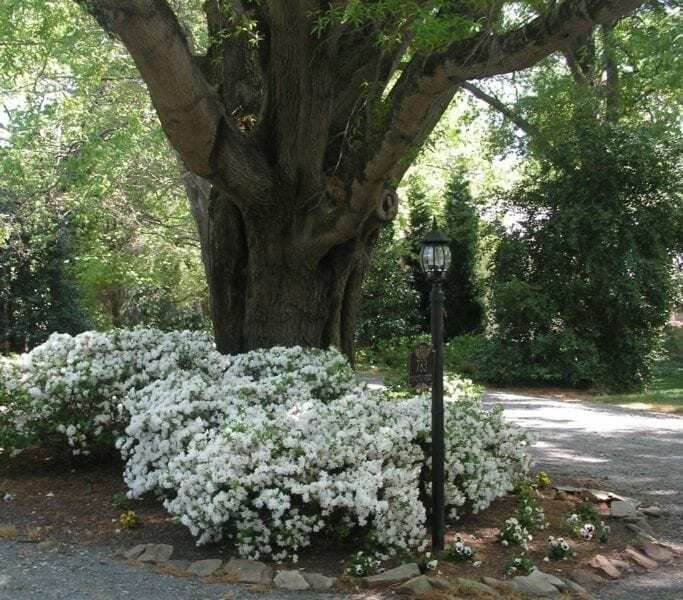 He and his wife, Sue Bartlett, own The Cedars Davidson Bed & Breakfast.